We're sorry, but an error occurred while loading your personal security report. 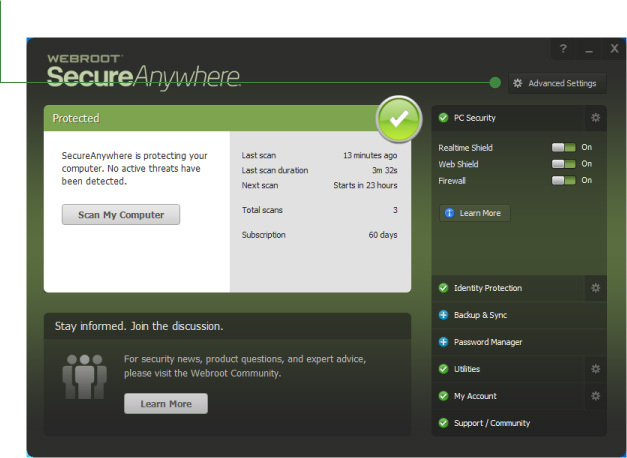 Please try accessing the report at a later time by clicking "See the Report" within your Webroot SecureAnywhere® product. If you continue to experience this error, please contact us for assistance. No malicious file activities have been detected on your devices. Webroot has classified file activities as safe, and will continue to check all files and their actions automatically to make sure you're protected. Webroot scans your devices for threats without interruptions or slowdowns. System Optimizer removes traces of your online activity and files that show your computer use. The Firewall monitors data traffic traveling out of your computer. It looks for untrusted processes that try to connect to the internet and steal your personal information. Identity Shield secures your browsing sessions against identity theft and ensures your personal information stays protected as you bank, shop, and interact online. As you browse, the Web Threat Shield alerts you to websites that may pose a threat. The Rootkit Shield blocks rootkits from being installed on your computer and removes any that are present. Infrared adapts itself to your security needs by identifying suspicious files and malware before it harms your system. The USB Shield monitors an installed USB flash drive for threats, and blocks and removes any threats that it finds. The Offline Shield protects your system from threats while your computer is not connected to the internet. Log in to your Webroot account to manage your devices and features, and get more detailed security information. Create a Webroot account to manage your devices and features, and get on-demand security information. Password Manager protects your login credentials and securely logs you in to all you sites with just one click. To store more passwords, log in to your account. Password Manager is included at no additional cost. GET STARTED to protect your login credentials and securely log in to sites with one click. Password Manager protects your login credentials and securely logs you in to all you sites with just one click. Backup & Sync keeps your files safe from computer crashes and data loss. To back up more files and folders, log in to your account. Backup & Sync is included at no additional cost. 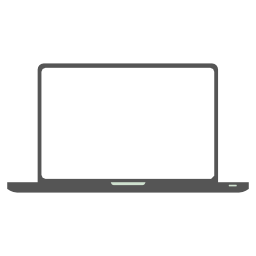 Securely back up your files and folders and access them anywhere, from any device. Backup & Sync keeps your files safe from computer crashes and data loss. Securely back up your files and folders and access them anywhere, from any device. Mobile security is included at no additional cost. Protect your devices so you can bank, shop, and browse securely from your smartphone or tablet. log in to your account. 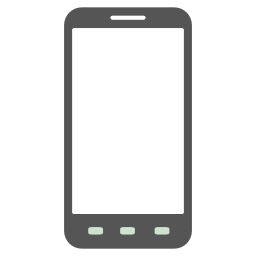 Mobile security is included at no additional cost. Protect your devices so you can bank, shop, and browse securely from your smartphone or tablet. Protect your devices so you can bank, shop, and browse securely from your smartphone or tablet. Android Device protection is included with Internet Security Complete or Internet Security Plus. When the Realtime Shield is off, that means your protection is disabled. To fix this problem, open the Webroot program on your computer and follow the instructions on the main screen. 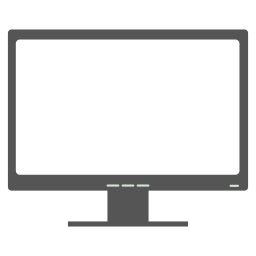 If you need additional help or troubleshooting, click here for technical support. 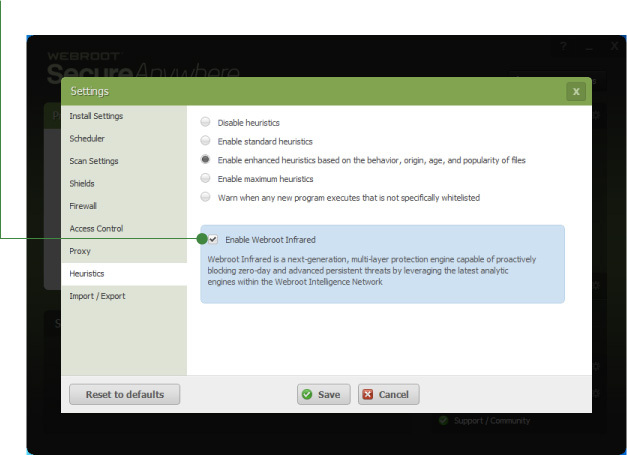 To enable Infrared, open the Webroot program on your computer and click Advanced Settings. From the Heuristics tab, click Enable Webroot Infrared. To enable the Firewall, open the Webroot program on your computer and click Enable Now. 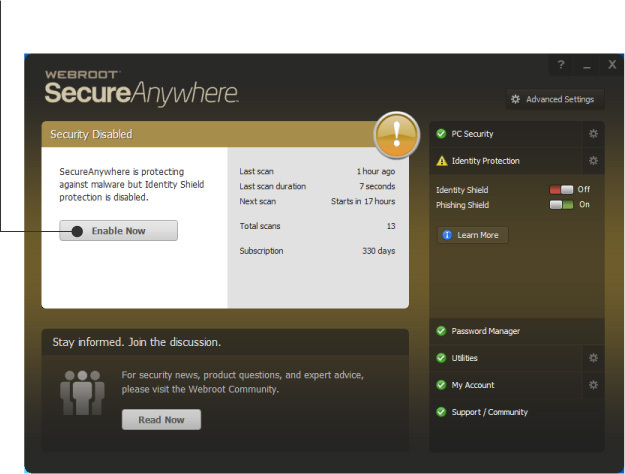 To enable the Identity Shield, open the Webroot program on your computer and click Enable Now. To enable the Real-Time Anti-Phishing Shiled, open the Webroot program on your computer and click Enable Now. To enable the USB, Rootkit, or Offiline Shield, open the Webroot program on your computer and click Enable Now. To enable the Web Threat Shield, open the Webroot program on your computer and click Enable Now.